Dr. Turja Chakrabarti founded Pratit International as a means to meaningfully contribute to the health inequities he encountered in his hometown Kolkata, but knew afflicted communities across the world. What began as a first step in addressing health needs in underserved communities has now grown into a grassroots movement towards health equity. Since 2007, he has led multiple teams of medical providers to Kolkata to facilitate bidirectional partnerships and projects aimed toward improving healthcare access in vulnerable communities. He has developed and tailored the mobile clinic program which provides much needed primary care services to thousands of patients every year. He works closely with each of Pratit’s physicians to ensure that best practices in primary care are followed in our clinics. He has also innovated Pratit’s community health worker program that goes above and beyond to ensure primary care follow up and door to door public health. Dr. Chakrabarti drives Pratit’s mission forward by leveraging partnerships through an inter-institutional consortium that now includes Johns Hopkins, Eastern Virginia Medical School and Medical Hospital. He has presented on the topic “Bridging the Global Healthcare Gap” at the United States Consulate General, Kolkata. His research on “Recognizing Barriers to Care for Cardiovascular Disease Patients in Urban Indian Slums” has been presented at the American Medical Association and the American College of Physicians. .
Dr. Chakrabarti earned his Bachelor of Arts degree from the University of Pennsylvania with a major in Health and Societies and a concentration in Global Health. Subsequently, he attended Georgetown University where he earned his Masters of Sciences in Physiology and Biophysics. He completed his Doctor of Medicine degree from Eastern Virginia Medical School. 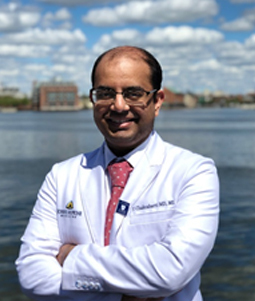 He is currently a senior resident physician in Internal Medicine at the Johns Hopkins Bayview Medical Center and travels frequently to Kolkata to manage the operations of Pratit International. Ritwik Bhatia brings over seven years of field experience managing the operations of Pratit International. Before joining his position on the board of directors, Ritwik served as an integral leader of Pratit’s mission on the University of Pennsylvania campus. His pioneering efforts led to the emergence of a viable organization of students that uniquely engaged in direct and sustainable development projects half a globe away. Moreover, he has worked to incorporate a diverse faculty board of advisors from various institutions that consult on the mission and vision of Pratit International. Ritwik has led multiple student trips to Pratit’s project sites in Kolkata, where he has played a critical role in forging relationships with local organizations, health care providers, and civic institutions. In his current role as Vice President, Ritwik guides the organization in building sustainability initiatives, social impact marketing, and developing partnerships with NGOs, corporate sponsors, and academia. 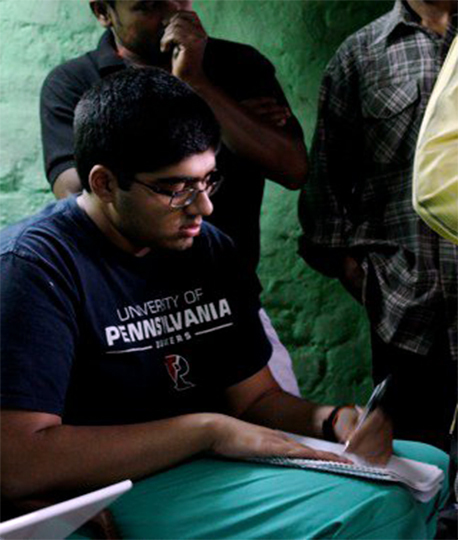 Ritwik holds a B.A in Biological Basis of Behavior from the University of Pennsylvania. He worked as a Post-Baccalaureate Researcher at the National Institutes of Health in Bethesda, Maryland. Currently, Ritwik studies as a candidate for M.D. at Vanderbilt University School of Medicine from where he continues his leadership with Pratit International. A born leader, Ankit met Turja during high school. They quickly became friends and found that they shared very similar passions. Ankit is experienced in business relations and has played a critical role in fundraising and organizing Pratit’s humanitarian missions. His expertise is in the field of international development and accordingly, he is already spearheading the effort to spread Pratit’s mission to far corners of the world. His ability for diplomacy and understanding have made bounds and leaps for Pratit as an idea and an organization. Most importantly, Ankit has the power to take an abstract goal and carry out the pragmatic steps that materialize it. Ankit is a full-time student at Syracuse University, where he studies International Relations and is a brother of Sigma Phi Epsilon. Ankit was born and resides in Springfield, Virginia. Kalyan Tripathy has managed critical components Pratit’s health programs since the organization’s founding. Over four years, his efforts have helped refine Pratit International’s outpatient clinics and primary care outreach. Kalyan has worked tirelessly with local community organizations and health providers in planning and implementing regular clinics. Moreover, he has been integral in designing an effective patient follow-up system as well as a patient history database. These programs have proven essential in ensuring that all of our patients receive care that goes beyond simple one-time examinations to a comprehensive circuit of treatment. A Kolkata native, Kalyan brings key local knowledge, which ensures that Pratit’s programs remain culturally sensitive and tailored to fit community needs. Prior to his position on the board, Kalyan served as the managing director of Pratit International’s branch at the University of Pennsylvania. Currently, his responsibilities involve direct oversight of outpatient services that aim to provide medical treatment to 3500+ patients across five communities in Kolkata in FY2012. In addition, he works to insure that at least 25 critically and chronically ill patients receive advanced treatment options such as surgical procedures and essential medicines. Kalyan graduated from the University of Pennsylvania with a B.A. in Neuroscience. Subsequently, he worked as a Research Specialist at the Center for Neurodegenerative Disease Research at the University of Pennsylvania’s Perelman School of Medicine. 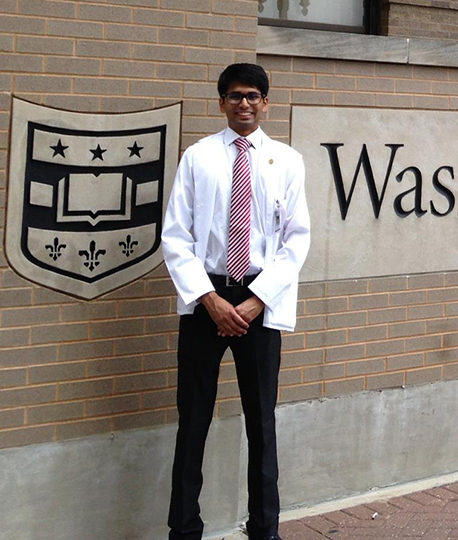 Today, Kalyan is a candidate for M.D/PhD at the Washington University in St. Louis School of Medicine. Have any ideas? Concerns? We’re open to listen and learn. We’d love to hear from you. Send us an email and we’ll get back to you shortly. Research and collaboration with Johns Hopkins is currently occurring at the level of resident physicians involved in Pratit’s work. Residents have been regularly visiting our project sites in Kolkata to gain first hand experience of our grassroots public health efforts in primary care. Outcomes of Pratit’s work have been presented at academic conferences at Johns Hopkins and fostered discussions on future collaborations. Faculty, residents and medical students from Eastern Virginia Medical School have been closely involved with Pratit’s mission for health equity and have sent multiple teams to Kolkata. Research projects conducted by EVMS have explored topics including the rise of cardiovascular disease in Indian slum populations and avenues for maternal and child health improvement in resource poor areas. EVMS has signed an official partner affiliation with Pratit International in March 2018, paving the way for future collaboration. Medica Hospital in Kolkata serves as a critical partner in expanding Pratit’s operations on the ground. Several patients who have required advanced therapies and interventions have received life saving care at Medica Hospital. Physicians from Medica Hospital have also been regularly involved in treating patients at Pratit’s clinics. Visiting delegations from US Medical Centers have rotated through Medica’s wards and been presented at the hospital’s academic conferences. NVBA serves as a platform for Bengali diaspora living in the United States many with a vested interest in promoting Pratit’s mission of health equity. NVBA has closely collaborated with Pratit to host numerous successful fundraising events. NVBA has also partnered with Pratit in its philosophy of No Patient Left Behind to coordinate life-saving treatment for members of the diasporic community in the United States.